A combination of Japan’s restrictive gun laws and the nonetheless passionate nature of gun-enthusiast otaku gave rise to a peculiar global phenomenon: Airsoft. For those who are unfamiliar, airsoft is a combat sport, similar to paintball, that’s played using replica firearms that fire small plastic BBs. The style of the game is inspired heavily by first-person shooter games like Call of Duty and Battlefield, and covers a wide range of game types and rulesets. The major difference between airsoft and paintball is the fact that, while paintballs leave a visible mark upon striking a target, airsoft BBs do not. This is one of the major elements keeping airsoft from gaining the level of recognition paintball has in becoming a professional sport. Because airsoft BBs don’t mark, there’s no way to prove a hit for sure. As a result, airsoft works on the honor system. Referees can help, but for the most part, airsofters must trust each other to call their own hits. Misunderstandings can occur, and are generally forgiven. Thick gear or clothing might cushion a BB’s impact to the point where it’s hard to tell if one took a hit or not, and depending on the rules of the playing field, ricocheting BBs may or may not count. Make no mistake, however: For the most part, airsoft BBs travel fast enough to make their impact noticeable, even through most thick clothing, and even if the impact isn’t felt, the sound of an airsoft BB bouncing off of protective gear like a helmet or body armor is distinct. True “victory” or “defeat” can never be 100% ascertained. A team may still be declared victor at an event, but the fact that one unsportsmanlike player who can manage to stay out of a referee’s line-of-sight often enough and long enough can turn the tide of battle if they’re never caught, simply by refusing to call their hits, muddies the waters. People can play outside the rules very easily, making “winning” and “losing” almost a moot point. As a result, airsoft, as an activity, is much more focused on the experience, rather than trying to be a sport. In so many words, it’s about having fun. The kind of mentality that values “victory,” however arbitrary, over having a good time, has no place in airsoft, in my opinion. Sports like paintball and laser tag are much better for that kind of competition. Airsoft’s appeal, to me, is that it’s a community thing. I drive up to the field, grab my gear out of my trunk, walk up into the staging area, and am welcomed by a bunch of guys and girls, all chatting, laughing, comparing gear and loadouts, borrowing magazines and batteries from each other, and having a great time. And this is all before the game even starts. The entire experience that encompasses “airsoft” is much more than just the game. It’s the gear, and the people you play with, as well. Let’s take the gear. Much of airsoft is a fashion show, and this is apparent when looking at any airsoft pick-up game. I’ve seen the guys in full multicam with helmets and night optics, brandishing Bushmaster ACRs, looking like they just stepped out of Call of Duty Modern Warfare 3. I’ve seen the girl in the hoodie, rolling with a hot pink M4. The Geeky Panda, a good friend of mine, wears a (real) Russian mountain suit and carries an M4. A friend of mine carries a Captain America shield into battle. Me, I wear polyurethane cat ears on my helmet, a US Air Force flight suit, and a body armor vest made of hard neoprene plates. The people really make the experience, however. Because the mutual trust in each other to play fairly is there, there’s rarely an issue, especially among friends and other close-knit groups. A camaraderie exists within the teams, regardless of who’s put on which team. People comfortably share trenches and cover, stack up in close quarters, and watch each other’s backs. A similar camaraderie exists between the teams as well. It’s friends shooting at friends, and people aren’t afraid to compliment their “enemy” on a well-executed shot in post-game. They’re not blinded by the pursuit of “victory.” In fact, they’re invigorated by the pursuit of an experience. In no uncertain terms, it’s just a game. This is why C3-bu resonated with me so much. C3-bu isn’t just an anime about cute girls playing airsoft. 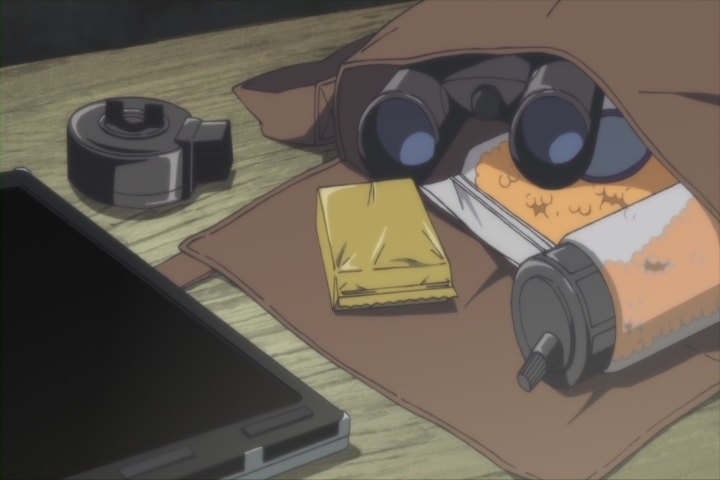 C3-bu is an anime about airsoft. It’s “Airsoft: The Animated Series.” The airsoft battles are certainly a big part of the way the show portrays airsoft, but to those who have played, the entire show can be looked upon as the airsoft experience. 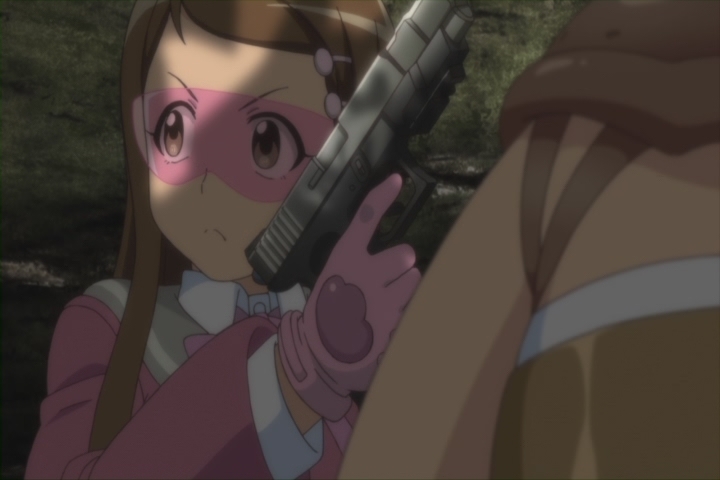 I watched the first episode of C3-bu the day before I played my very first game of airsoft, and I was floored at just how similar the experiences were. To summarize the show, Yura Yamato, a new freshman at the Stella Women's Academy highschool, gets press-ganged into joining the C3 club, the school's airsoft club, and ends up loving the game. Obsessed with “coming out of her shell,” and seeing her talent for airsoft as an opportunity to make her big debut, she immerses herself in the game, but goes down the misguided path of being more concerned with winning than with having fun, and alienates her clubmates, before realizing her grave mistake and lightening up. C3-bu captured the spirit of airsoft so well that seeing Yura become so focused on winning, and further, become so focused on personal glory, was kind of painful to watch, and other airsofters I’ve watched the show with agreed with me. The C3 club is the quintessential group of airsoft friends: A rag-tag bunch of fun-loving misfits who fill different roles, have different specialties, and use all sorts of different equipment, all brought together by the love of airsoft. They go out into the woods with their goggles on and their guns out, shoot at each other for a couple hours, then come back, eat, talk, and laugh. That’s exactly how airsoft games go, and throughout the course of the show, Yura became exactly the kind of person who ruins that dynamic (And, to be fair, Rin, the rival team's leader, is too, but only to an extent. She and her team focus on victory, but they’re still sportsmen about it. They don’t cheat to win.). This is even an issue in airsoft. The airsoft community has a few teams and individuals who are infamous for unsporting conduct. They’re almost universally reviled and ridiculed. Sportsmanship is a cornerstone of airsoft. The game can’t operate without it. Knowing how to lose gracefully is a key skill every airsofter should have, and people who lack that skill ruin the dynamic, ruin the game, and ruin their reputation with other players. Yura’s thirst for “victory” at all costs alienated her friends and created a tense atmosphere around her, and the most genius thing about it is that the show adopted the same tense atmosphere. The show, which began as a slice-of-life, “cute girls doing cute things” show, took a quite darker turn as we saw Yura go from enjoying the experience of airsoft to focusing solely on the tenuous competitive aspects of it. 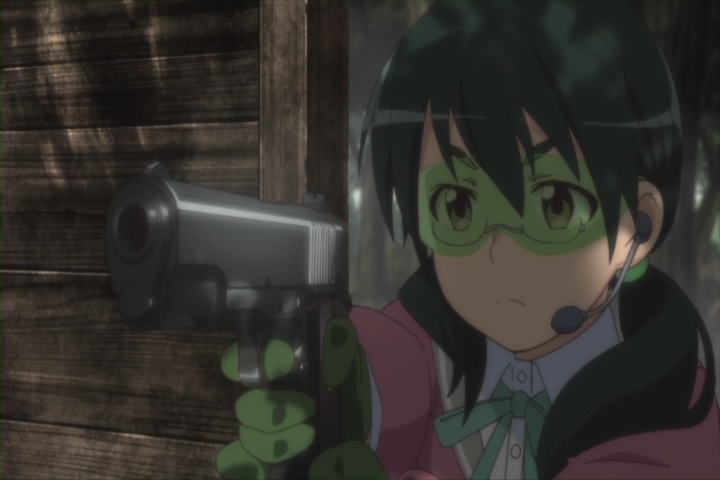 One clever thing C3-bu did was show exactly how Yura experienced airsoft. Throughout the earlier parts of the show, she would periodically go into moments of delusion, where she experienced moments of airsoft as realistic experiences, such as a scene from Rambo, or the Normandy landing of Operation Overlord. These delusions largely stopped once Yura's focus shifted. To me (and I’d wager this applies to many other airsofters as well), airsoft is played in the pursuit of what I call, for lack of a better term, “moments.” In the context of airsoft, these “moments” are situations in which something awesome happens. It’s getting immersed in the game. It’s being “in the zone.” It’s that moment when you catch a magazine tossed to you by your teammate and load it into your gun. It’s that moment when you’re walking through the woods and you hit the deck hard as soon as you hear BBs whizzing through the leaves nearby. It’s any moment you’re doing a one-handed vault over a low wall. Yura’s delusions are a perfect illustration of what one of these “moments” feels like. When Yura stops having fun experiencing airsoft, the “moments” also stop, but when it all comes back around, and Yura comes back to the C3-bu and enjoys airsoft again, her delusions also come back. I love airsoft. When the sun’s setting and I’m tired, and my Hi-Capa's magazine has gone through a good bit more green gas, and my M4 magazines are empty, and the memory card in my GoPro is full, and I’ve got a few new stories to tell, and I wake up the next day to sore legs, I had a great time. C3-bu captured that experience, the good and the potential bad, and put it in anime form, right down to the smooth jazz playing in my head as I dash from cover to cover on the airsoft field. Enjoyed the article? Subscribe to our email newsletter and be the first to know about new articles, videos, events, projects, and giveaways!